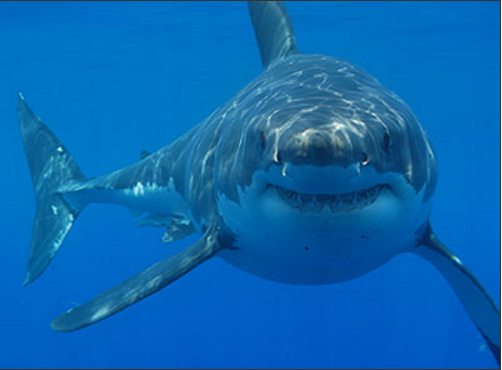 Famous Fake Shark Pictures And How To Spot Them - We Love Sharks! 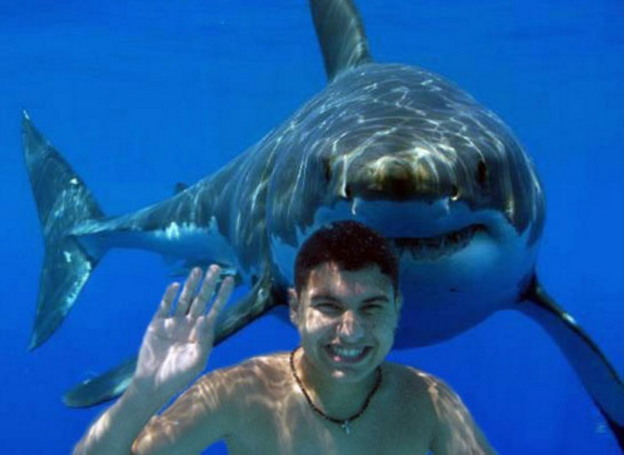 Famous Fake Shark Pictures And How To Spot Them - We Love Sharks! A look at some famous fake shark pictures and a few tips for spotting these fakes. Sharks are awesome creatures, we know that already. But people still fear them. In fact, they fear them a whole lot. However, that doesn’t stop them from being fascinated with shark ‘sightings’ and pictures. This combination of fear and fascination creates the perfect platform for the continuous circulation of fake shark pictures. Now, add other factors to the mix like extreme weather, and the power of the internet (especially social media) and things can easily get out of hand. Many of these pictures come out just after a major disturbance like a flood or storm. And we don’t know why people take the time to create and share these fake shark pictures; maybe to create a sense of crisis, generate fake traffic to their blogs or social media accounts, etc. but for sure they can be pretty annoying and some actually look genuine. Let’s look at a few of the most popular fake shark pictures out there and then we’ll put our detective hats on and learn how to determine if a shark picture is fake. Claim: A shark breached the water during a military drill and is about to attack military personnel climbing a helicopter ladder. This picture has got to be the most infamous of them all. 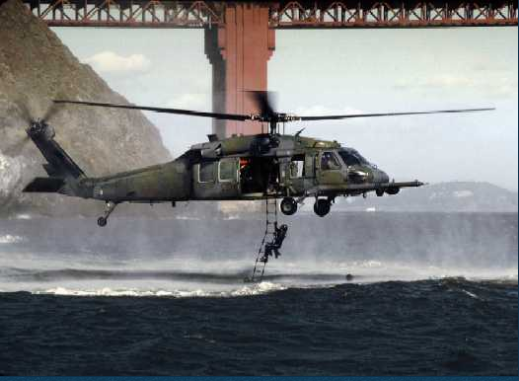 It gives the impression that a large great white shark is leaping out of the ocean and is about to attack military personnel climbing a ladder dangling from a Special Forces UH-60 Black Hawk helicopter. It was extremely popular back in 2001 and was widely circulated as an email. The email even alleged that National Geographic had awarded it the Photo of the Year award. As expected, the image gained popularity till it was finally revealed to be an Internet hoax. There were suspicions that it might be fake when people realized that the image looked so much like a scene from the 1996 Batman movie. In that scene, Batman was attacked by a shark while climbing a helicopter ladder. It’s actually two pictures that were merged to produce a remarkable looking final image. 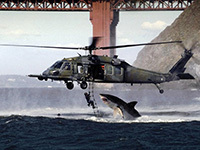 The first (above) is the picture of a military drill (in front of the Golden Gate Bridge), while the second one (below) shows a shark jumping out of the ocean (False Bay, South Africa). 2.Collapsed Shark Tank At The Scientific Center, Kuwait. 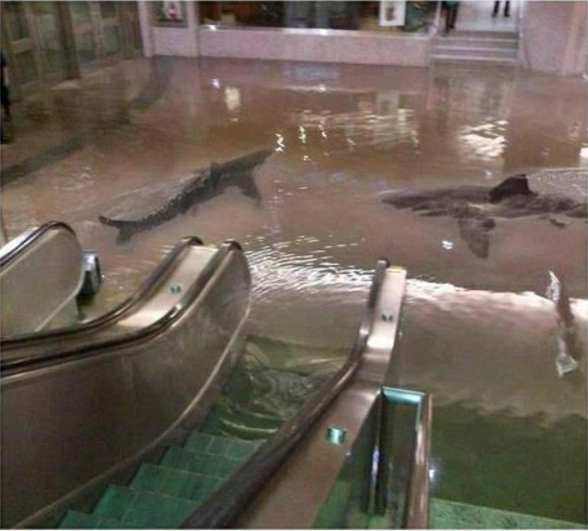 Claim: A shark tank in Kuwait collapsed and released the sharks to swim around at the bottom of a pair of escalators. The photograph shows sharks swimming at the bottom of an escalator after the collapse of a shark tank. The same image popped up again after Hurricane Sandy raising serious doubts about its credibility. Yes, there are shark tanks at the Kuwait Scientific Center but they are intact. Also, the real picture actually shows a portion of Toronto’s Union Station that was flooded with rainwater and sewage back in June 2012. 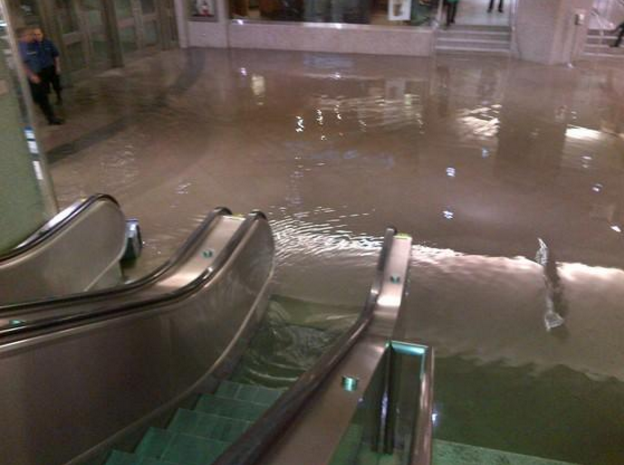 The neighboring Toronto Royal Bank Plaza complex was also affected by the flood. 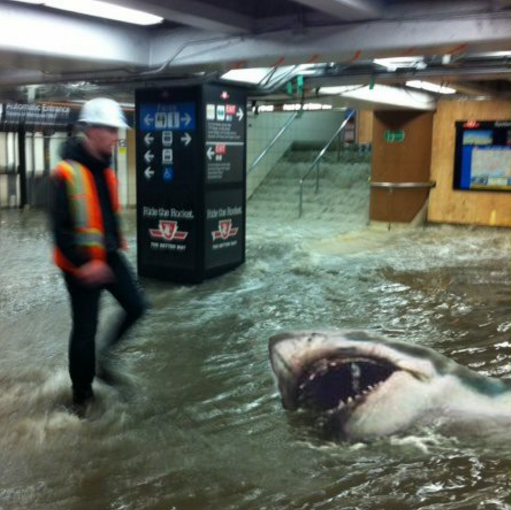 People found the whole thing hilarious and you can see more examples of the memes it generated on social media here, Toronto Union Station Meme Floods Social Media. 3. Diving Couple With Shark Behind Them. 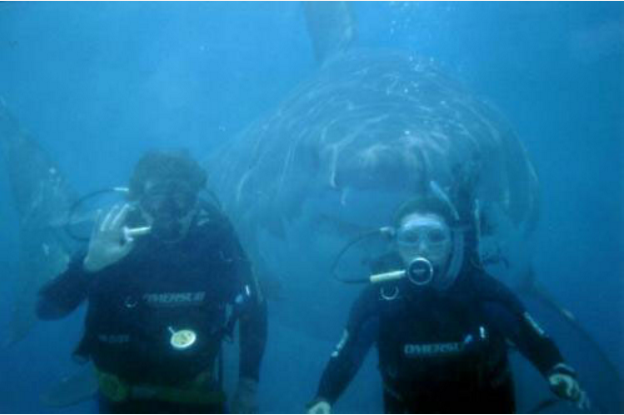 Claim: A couple went scuba diving and a shark suddenly appeared behind them as their 15-year old son was trying to take a picture. According to the story, a couple along with their teenage son were vacationing in Australia. They went scuba diving and the couple posed for a picture. Just before snapping the picture, the father notices that his son, who is holding the camera, looks frightened. The father asked him if there was anything wrong. The boy says ‘No,’ then he quickly takes the picture and begins to swim frantically away so his worried parents follow him out of the water. Back on the boat, their son tells them that a large great white shark had swum up behind them while he was snapping. Of course they don’t believe him until they get back to their hotel room and upload the image on their computer. This picture, and story, became very popular on the internet mainly due to the clever use of the creator’s Photoshop skills. Also, the couple appear to be completely unaware of the massive shark behind them, and the shark is smiling as it poses for the picture too. Very creepy stuff indeed. Below is the original shark photo that was used to create the image. It was originally uploaded on Wikimedia Commons by Hermanus Backpackers, South Africa. You can clearly see that the image was manipulated to look so much larger than the couple. 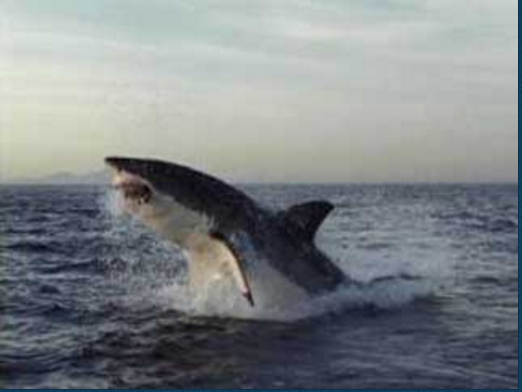 The same image was used to create even more fake shark pictures like the one below. This particular shark must really like pictures. Hmm. 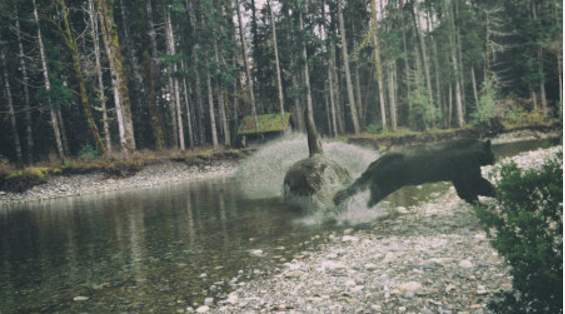 Not An Actual Shark Picture But A Killer Whale Chasing A Bear: A Popular Hoax Released On April Fools Day By Heart Of Vancouver. The people creating these images are combining usually two original pictures. Look for pictures of the city or location where the shark incident ‘occurred’ and enter the images on Google Image. If you can identify the shark species in question, you could also search for it on Google Image. In seconds you’ll see what’s really going on. They basically insert the shark picture into the picture of an existing city or other location. Check some popular hoax busting sites like Snopes.com that thoroughly investigate fake pictures. Some of the pictures are just not logical. 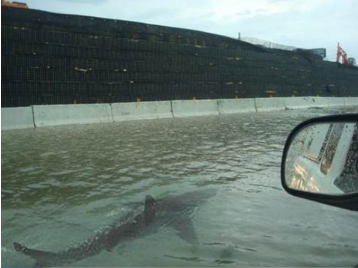 Take the shark in the flooded Puerto Rico street picture. You can see the water level is way below the side mirror of the car. Can a shark that large swim so freely in such shallow water? Shark pictures are always fun to share and we can learn so much from them. But, if you follow these tips, it could save you from wasting your time before you click the ‘share’ button on the next set of fake shark pictures you come across.